I encounter a baffling amount of ISD jargon in my day-to-day life. It’s in my books, on the discussion boards, and even in my personal life (my husband and my best friend are both Instructional Designers). As a student with little prior experience with ISD, I’m often caught in the uncomfortable position of having to pause what I’m doing to find the right resource to define these terms and concepts. By the time I’ve paged through a few books or gone down the rabbit hole of the internet, I’ve lost my train of thought. 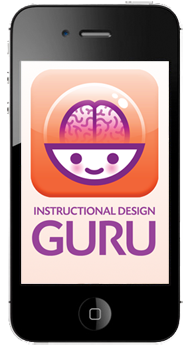 Luckily, I stumbled upon Connie Malamed’s new app, the ID guru, while exploring her blog, the eLearning Coach. Available for both iPhone and Android phones, this app is simple, with no bells or whistles to complicate a quick, inconspicuous search. Currently, The ID Guru defines more than 470 key terms drawn from the fields of instructional design, cognitive psychology, social media, multimedia, technology and law. Want to look up a term quickly? Tap the search icon and enter the term or search alphabetically. Have some time to kill and want to explore? Browse for terms by categories (Cognitive Psychology, Instructional Design, Learning Theory, Legal, Multimedia, Social Media and Technical) or simply thumb through the list. Many of the terms are hyperlinked to each other which makes exploring the relationships between concepts effortless. As a novice, my favorite part of the app is the little light bulb icon that shows up under a number of the definitions. This icon identifies tips from Malamed herself, so you aren’t just getting an easy to use list of terms, you’re also getting the wisdom of someone who has practiced in the field for more than 20 years. I would love to see the next generation of this app take The ID Guru from a simple tool to a more engaging learning instrument with infographics, links to podcasts, and more insider tips. For right now, though, I definitely feel like I got my money’s worth. $2.99 is a small price to pay when it comes to feeling competent at school and with my peers. For more info on her app, visit the eLearning Coach. PS Have you tried the ID GURU? Share your experience by commenting below!